Simple, fast, and a critical step. Calculating a customer’s age is one of the most important steps in “carding” under 27 year old customers of age-restricted products. 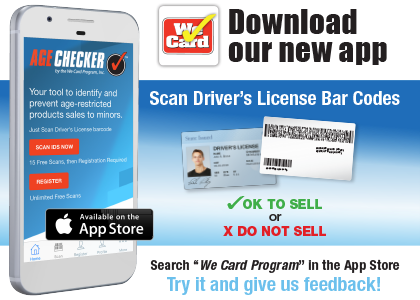 That’s why we’re introducing the We Card Age Checker App to provide you with another tool to calculate customers’ ages and determine “sell” or “do not sell” for age-restricted products. Download We Card’s Age Checker App for free in the Apple App Store. 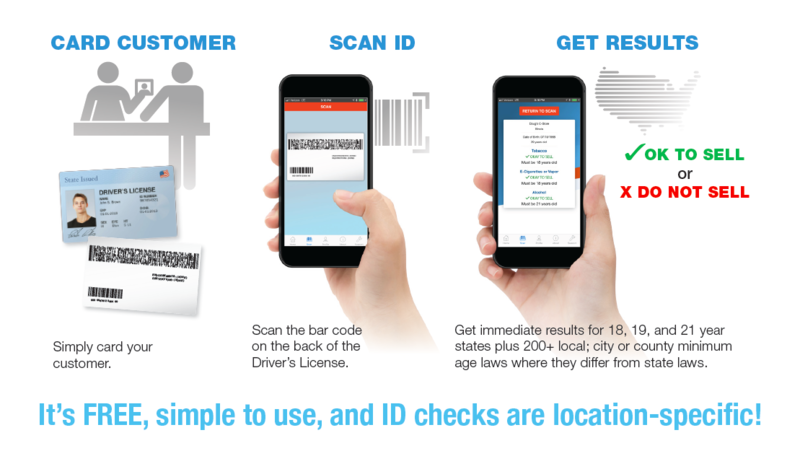 The Age Checker App provides scanning results based on the known state or local minimum-age laws of 18, 19 or 21 years old. Set your store’s location, and it will provide scanning results for tobacco, e-cigarettes and vaping products, and alcohol. Age Checker will also display an “Expired ID – DO NOT SELL” message so you will know to deny purchase attempts when someone uses an expired ID – which are not considered valid IDs. Employees should continue to “Hold, Sweep, Flip” when examining an ID. Does the photo match the customer? Is the ID cracking, peeling or altered in any way? We Card’s Age Checker can make age calculation easier but while it’s not a 100% solution, it’s another tool you can add to your overall effort to identify and deny minors’ attempts to buy age-restricted products. Retailers should also keep in mind that if there’s uncertainty about an ID, they should ask for a second form of ID. And remember that retailers are not required to sell an age-restricted product it they believe a purchaser is underage. Download it, try it . . . and let us know what you think. And if your city recently changed its minimum-age requirement (such as increasing it to 21 years old, please let us know and we’ll update the App for your location).